It’s the time of year when pumpkin flavor dominates everything. That’s OK, we can’t get enough of this comforting plate topped with toasted walnuts and pumpkin seeds for a seasonally appropriate way to start our day. A cinnamon-spiced mascarpone elevates this dish making it a must-order whenever we stop in for brunch. After being dipped in egg wash and then encrusted in corn flakes and shaved coconut, this French toast is stuffed with strawberry preserves and finished off with fresh fruit and some more coconut for good measure. 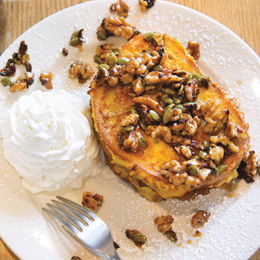 Thick slices of wheat French toast are topped with mascarpone, walnuts and drizzles of caramel sauce, but the real wow factor comes from the addition of chopped smoked bacon. If you like churros— who doesn’t?—than this creative take on the revered dessert treat is a welcome change of pace from the French toast you’re accustomed to.